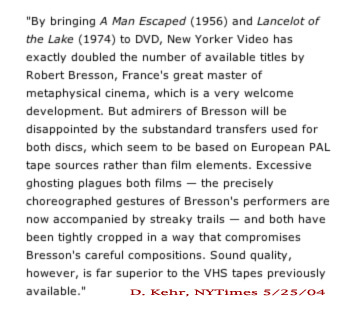 The following are two emails received in response to our recent articles on PAL Speedup and the New Yorker DVDs A Man Escaped and Lancelot of the Lake. The correspondence is reproduced by robert-bresson.com with the kind permission of the authors. Subject : PAL speedup: "fact of life"? accepted as a 'fact of life.'" Which makes the neglect of such companies all the more maddening. home-video transfers will be handled by Criterion for those titles. NIGHTS OF A DREAMER, LANCELOT DU LAC, LE DIABLE PROBABLEMENT, and L'ARGENT. been put on DVD), but it has become a serious problem. leverage that brought the Fassbinder catalogue to Winstar (now Wellspring). © 2004 — robert-bresson.com / mastersofcinema.org. Opinions expressed herein are those of the authors and do not necessarily represent the views of robert-bresson.com and mastersofcinema.org personnel.